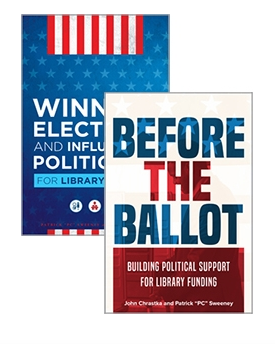 This post is the second in a series on tools from political campaigns that can be used to arm librarians in the face of growing opposition during the Trump era where anti-tax and anti-government sentiments have a much stronger voice than ever before. 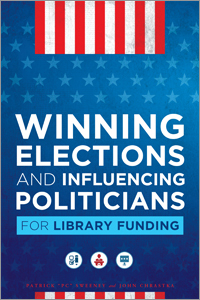 So you need more money and people for your library, political initiative, movement, or cause? Try using a ladder of engagement. In any political movement there will undoubtedly be times when the organization will have to ask other individuals or organizations for resources. It is a fact of political life that initiatives and movements rely on the generosity of others to continue to grow and expand their influence. However, even those that are familiar with an organization and support it may take some convincing to part with their precious time or their hard-earned cash. After all, supporters are not simply ATM machines. They are people with feelings, desires, and needs to be met. That’s why even staunch supporters are often reluctant to give up time and money to a political cause, preferring to support it with their words over their deeds (often referred to as “Slacktivism”). Of course, this causes problems for many non-profits, organizations, or movements because they rely on a higher level of engagement to survive and to have the resources they need to succeed. It doesn’t matter if the organization needs a donation, a supporter’s time as a volunteer, or other resources, the method for engaging any audience in a way that gives them the opportunity to get involved and sacrifice their own resources to make a difference in the world is the same. The ladder of engagement is a fundamental tool for any organization or initiative that can be used to gradually build the relationships that are required to convince the public to support a cause and libraries can use it just as well. The ladder represents the way that people move from being unaware of a cause or an organization, to becoming broadly supportive of it, and finally to becoming active within it. For example, if an organization approaches someone for a contribution of $500 dollars to a cause they know nothing about, then their chance of success is slim to none. If the organization first took the time to develop a relationship with a targeted individual and then asked for a donation of $500 when the target was mentally or emotionally prepared to be asked, then there is a much greater chance of success. This is one of my favorite examples of a ladder of engagement although there are many others online. In this example, we start with those that are “aware” of the cause and move to those that are “interested” and “interacted.” These initial three steps usually happens through marketing and advertising. This is how we get people to take notice of a cause, buy a product, or walk through the doors of a library. “Interacted” is also where people begin to take small actions such as liking a Facebook Post or Page. But this is where building supporters and activists is different than marketing. We want people to move beyond just supporting a cause with slacktivist actions and become fully “engaged” and “evangelized.” We want people to take real meaningful action. In order to move people up this ladder, a campaigner needs to spend time and resources making people aware of the campaign. Next, they need to give them small opportunities to get involved or show that they care (changing their profile picture, sharing a post, etc…). After that, they should be given a place to be engaged or take more meaningful action like signing a petition or asking their friends and family to get involved. And finally, asking them to take that final action such as making a donation or volunteering for the cause. One of the best examples of this tool in action was from the Obama Campaign in 2012. First, people were made aware of Obama’s campaign by seeing boosted posts on Facebook. Then they were encouraged to take an easy next action by ‘liking’ the Barack Obama Facebook page itself. Then the campaign asked people to “sign a birthday card” to Obama on Facebook in the lead up to his birthday. When people took this step they were asked to fill in their name and email address and the campaign had a valuable piece of information in their database: an email address. Finally, people who participated in all of the previous steps get a fundraising email. But instead of a direct request for money they are asked to contribute to the campaign in return for a bumper sticker or t-shirt. Never under-estimate the power of swag! Those that gave to the campaign are then asked to volunteer for the campaign or join at a deeper level in some other way such as organizing a house party, canvassing, or phonebanking for the campaign. The people that a movement engages with undoubtedly start off having almost no knowledge of what it is about. The ladder of engagement allows a campaigner to walk with people as they get to know the movement and what it stands for. The more time a community organizer spends with someone then the better they get to know each other and the more likely they are to give. Luckily for libraries, most people know that libraries exist and many American’s use their library so librarians typically won’t be starting from the “Unaware” rung of the ladder. Creating a ladder of engagement for an audience online is fairly easy with Social Media. Facebook’s data is extremely accurate and allows a user to simply upload a CSV of an audience using just name and address and Facebook will connect that list of people to their Facebook Profiles (we won’t think too much about how scary that is). This means that if a library can generate of a target audience from any of wide range of possible sources, upload it into Facebook, and then target that group with ads then they can move them up the ladder of engagement. For example, a library can download a list of known charitable individual donors in the community from AtoZ databases (or ReferenceUSA) that includes name and address and upload that list to Facebook. Then the library can target that audience with ads about the importance of the library. After that, they can ask that group to sign up on an email list or other creative form that gathers more data. Then they can ask the public to change add a badge to their social media or take some small action. Once that is accomplished the library can then begin targeting them with more customized emails that encourage donations or other supportive actions. It is easy to create ladders of engagement for people offline as well as it is online. Many times it simply starts with some research for a target audience or individual. A library can easily use a donor list, AtoZ databases (free with a library card), or Facebook to build their initial lists. Then plan their target’s engagement from there. For example, if the library has a goal of getting donations from some of the largest companies in their community, the library would download a list of the largest companies from AtoZ Databases (or ReferenceUSA) where the email addresses or phone numbers of many of the executives can often be found. From there, a librarian would reach out with an email or phone call to introduce the library and its needs using a strong script (we’ll talk about developing scripts later), and then if the executive is receptive to the library the librarian can offer to meet the executive for coffee to talk more about the library. Next, the librarian might find some way to get the company to involved in the library in some small way. At many of the libraries I have worked in, we have been able to get volunteers from companies, sign their employees up for library cards, or have them sponsor or run a program. When this relationship is built, the library will have a much easier time asking for a donation for a capital campaign or an initiative. To have an effective ladder in an organization it needs to set the ladder up in advance and understand what is needed from the process. It’s important to take the time before beginning to think about the goal of the ladder or where it is that people need to end up. Is the organization looking for money, or volunteers, or letters to editor, or people to show up at a city council meeting, etc…? In any of those cases, thinking about where people are in the community that need to be reached and helps understand how best to reach them. It’s always best to meet people where they are already. It might make sense to reach them online, or in person, or a hybrid of the two. Then plan about small actions that people can take to get more and more engaged in the library until finally, librarians can reach out to them when they are most primed to give.